How cute! 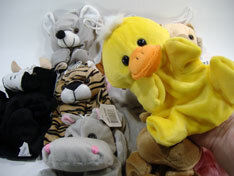 Variety of plush hand puppets using all five fingers. All it takes is two of these, a big cardboard box, a couple of kids and they’ve got their own TV show! 12 inches average height. Poly-plush fabric. $1.75 each for 90 or more. $1.55 each for 180 or more.